I am intrigued by the thought of aliens visiting our planet. The famous Roswell, NM, site of our country’s only “confirmed” alien sighting is on our list… and don’t you worry, when we get there, we’ll get to the bottom of it. In all seriousness, I am not sure (and I guess no one is) if aliens actually do exist but I do know that I don’t have the answer either way. 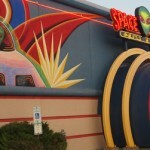 In scoping out Fargo, ND, I saw this restaurant called Space Aliens. The description sounded cool so I had high hopes that this would be a fun attraction. Our first night in North Dakota, we ventured out to Fargo (we are at an RV park in Moorhead MN – we know it’s cheating a little bit, but we couldn’t find any parks on the ND side). Our plan was to visit the Fargo Walk of Fame and drove right past this unusual restaurant. This was awesome, since normally we have to drive 30 minutes between destinations, but to hit two right in a row was very convenient – a bit of serendipity. After 5 minutes at the Hall of Fame (you’ll understand after reading that article), we turned back down the block to the restaurant. We had already eaten dinner at home not expecting to find this on our drive, so our plan was to have a quick drink and appetizer. The outside of the building was amazing. The themed signage was very well done and precisely true to the theme. Walking into the restaurant, we were immediately greeted by a hostess and a black-lit displat case featuring all the “souvenirs” the restaurant could squeeze their name on – plastic bracelets, t-shirts, cups, pencils, etc. We ordered drinks – Kimmer a strawberry milk shake and I a margarita. They came quickly, and we ordered an appetizer of “alien rockets” – potato-lined jalapeño poppers. While we waited, we played a few games on the Mega Touch. Photo Hunt is always a great way to pass the time. We munched down the appetizer when it came – it was good and interesting – like jalepeno poppers, but not quite. Kimmer would have liked a more attentive waitress as it took a while to get something else to drink after he wolfed down his milkshake. As we were walking out, we discovered an arcade also in the restaurant. Luckily, Kimmer didn’t find it sooner or he would have donated an extra $20 to the place in playing all the games. Overall, this is a very fun themed restaurant that is very well and definitely worth a stop if you are in the area. For more information visit here. Hippy alien from the planet Sixties – Peace! Many collectibles on display – a sci-fi geeks dream!